I have enjoyed music for as long as I can remember. My mother taught me to play the piano and I went on to earn a master’s degree in music. But it is only lately that I have fully begun to appreciate the therapeutic value of music, both for the caregiver and for the care-receiver. As caregivers we often have so many tasks calling our name that it is easy to become overwhelmed. But bringing music into your home can yield benefits far beyond the minimal time spent initiating it. Music helps with physical coordination. As my mother-in-law’s sense of balance deteriorated, I began walking with her, especially when she first got up in the morning, placing my hands on her waist as I walked behind. One day, on impulse, I started whistling “The Bunny Hop.” She immediately responded to the upbeat music, whistling with me (in tune! ), picking up her feet instead of shuffling. She even gave an occasional kick in time with the music. I now whistle or sing whenever we are moving throughout the house to encourage her to move along joyfully. My mother-in-law, who is in middle stage Alzheimer’s, often sings to her animatronic cat. This cat has brought her a sense of purpose (“taking care of my baby”) and emotional connection (the cat doesn’t expect her to respond verbally, and gets more kisses and hugs in a day than most children do in a week. )3 Mom may hum “The Star-Spangle Banner” and follow it with “Silent Night.” Regardless of her song choice, it brings joy to both of us when she sings. Singing hymns and Scripture choruses will help each of you to hide God’s word in your hearts. They will refresh and encourage both of you as you reflect on the great truths and theology in hymns of the past.4 You will be blessed by the rich theological insights in these classics. Make up new, silly words to old folk songs. Move or dance to the music of her generation. It is good for her circulation and recalls happy memories of her youth. Hearing this music will make your routine tasks go faster, too. Our sons sang regularly at local nursing homes when they were growing up. They wore costumes relevant to the current holiday and sometimes did motions while they sang. The combination of children plus music plus prayer worked wonders for the residents. Many who could no longer carry on a conversation sang along with the boys on the old favorites and hymns. Many who were agitated when the staff wheeled them into the activity room were calm after the first couple of songs. Perhaps your grandchildren or someone else’s children would enjoy developing a similar ministry for your loved one and others. 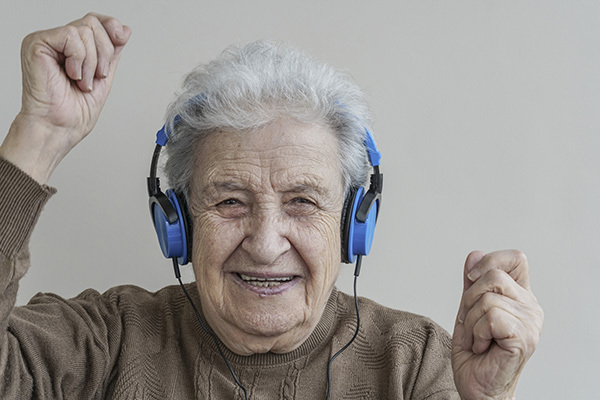 Don’t neglect the physical, emotional, and spiritual benefits of including music in your loved one’s daily life—you will be blessed, too.